Bethany Atkins gravitates toward the visual. When working with quantitative data, she invariably ends up with graphs and charts; with conceptual concepts, she turns to mind maps and metaphors. She pairs imagery and language together precisely, allowing her to thrive in projects that require communication, facilitation, and analysis. She’s always alert to the underlying details of a project and how they support — or undermine — the proposed path forward. Bethany brings a strategic, systems-thinking approach to her work, which has spanned international development, energy efficiency and domestic policy. Her experience includes roles in the Peace Corps and at PECI (now CLEAResult), where she designed information and data structures, led change initiatives, and provided strategic reporting and analysis. 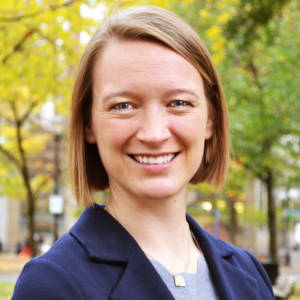 Bethany holds a master’s degree in public affairs from Princeton University and bachelor’s degrees in political science and global studies from Pacific Lutheran University.